Isokoski has all the attributes of a supreme Straussian soprano: a radiantly beatiful voice, unblemished legato, lustrous high notes and the ability to float those sumptuous phrases on apparently limitless supplies of breath. 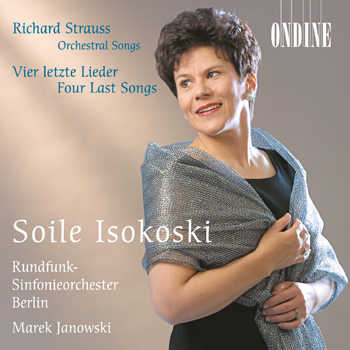 In her outstanding rendition of fifteen selected Strauss songs, Soile Isokoski unveils a new dimension of singing: she uses her voice like an instrument which has not been invented yet for the orchestra. This is a great recording of Strauss's Four Last Songs; you'll find it at the top of my 2002 Want List. Isokoski sings Strauss as if it had been written for her. (...) the Berlin Radio Symphony plays like the Berlin Philharmonic. Soile Isokoski is (...) a wonderful Strauss singer with a beautiful lyric soprano voice - you can just float away on the sound. Strauss singing doesn't come much better than this. (...) Here she brings her gifts of sheer beauty of sound combined with a quite unaffected approach to pieces that have suffered enough in their time from over-interpretation. This great recording is up there with the greatest of them. I can't praise this beautiful release enough. (...) no lover of Strauss' songs or of great, elegant, un-prima-donna-ish singing would be without Isokoski's.